This is a chair based on classic lines, whose rounded backrest recalls the shape of antique medallions and whose seat is linear and geometric. Victoria Ghost is made of transparent or coloured polycarbonate and is formed in a single injection mould. It is stable, comfortable, robust, scratch-resistant and weather-resistant. 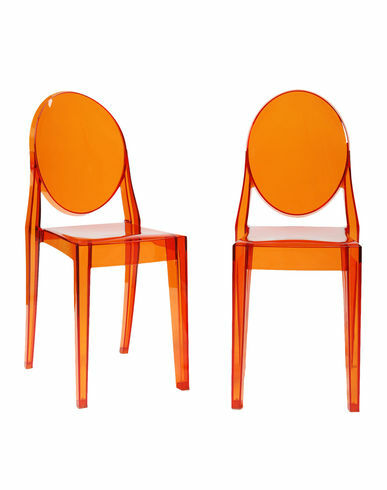 Victoria Ghost is yet another chair that has been created as a result of Kartell's vast technological know-how, amassed over the years in creating items that have made the company a recognizable name all over the world. This item has great charm and personality and fits elegantly into any type of environment. Set of 2 chairs.